Devcore Deploy On Attack (DOA) Backpack Plate Carrier Pack Prototype: Instant Anti-Rifle Combat/Tactical Body Armor, and Gun on Target in Seconds! (Video!) | DefenseReview.com (DR): An online tactical technology and military defense technology magazine with particular focus on the latest and greatest tactical firearms news (tactical gun news), tactical gear news and tactical shooting news. 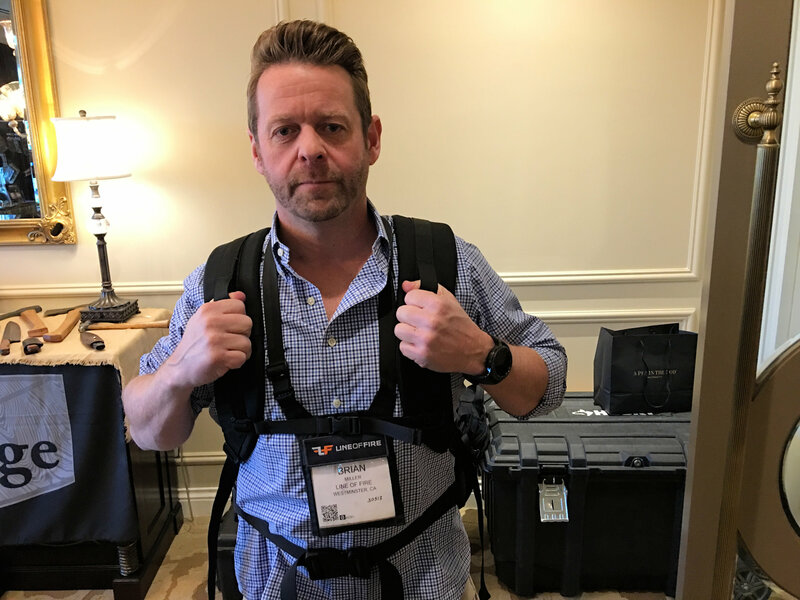 DefenseReview (DR) recently got to see an extremely cool new (patented) plate carrier pack prototype designed and developed by a brand new tactical-gear startup company called Devcore at SHOT Show 2018, and it really blew us away. 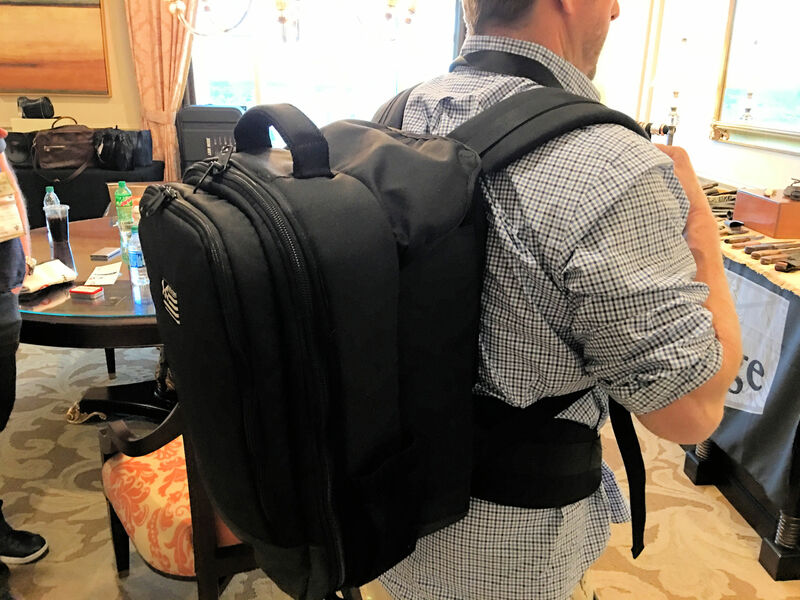 It’s called the Deploy On Attack (DOA) Backpack, and as you can see in DR’s short video below, it deploys in seconds (WITHOUT having to open the pack! ), turning the pack into instant anti-rifle body armor. Oh, and it also allows you to quickly draw a concealed pistol from the Velcro-sealed front plate/chest compartment (via a pull-tab, we believe) as soon as you’ve deployed it, and be on target in under 2.5 seconds. It’s pretty badass. And, it’s a game-changer for lo-pro/lo-vis (low-profile/low-visibility military special operations forces (SOF) missions. 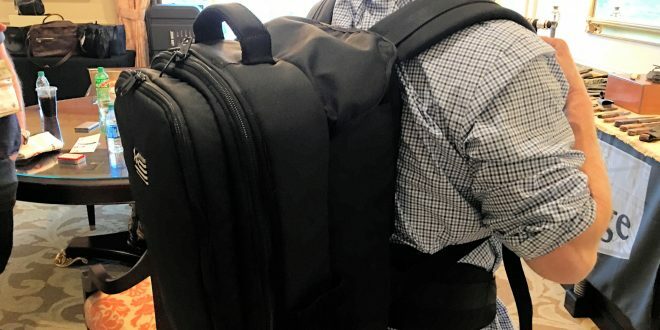 This backpack is a deployable concealment armor system. 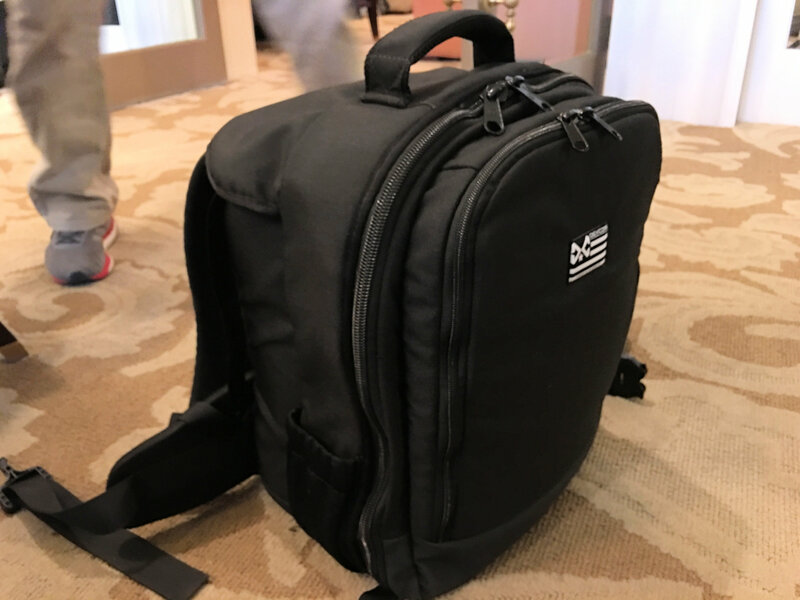 It turns a standard looking backpack into a full front and back plates rig in under 1.5 seconds from time of action. 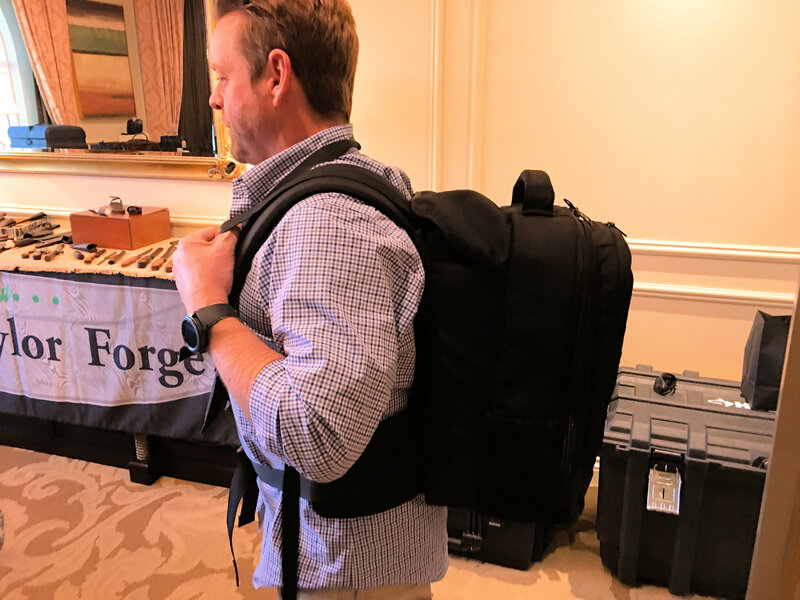 Unlike other bags that require your to remove the backpack to set it up and put it back on, this system allows you to simply pull two straps on the backpack shoulder straps to deploy a full front plate carrier into secure position. 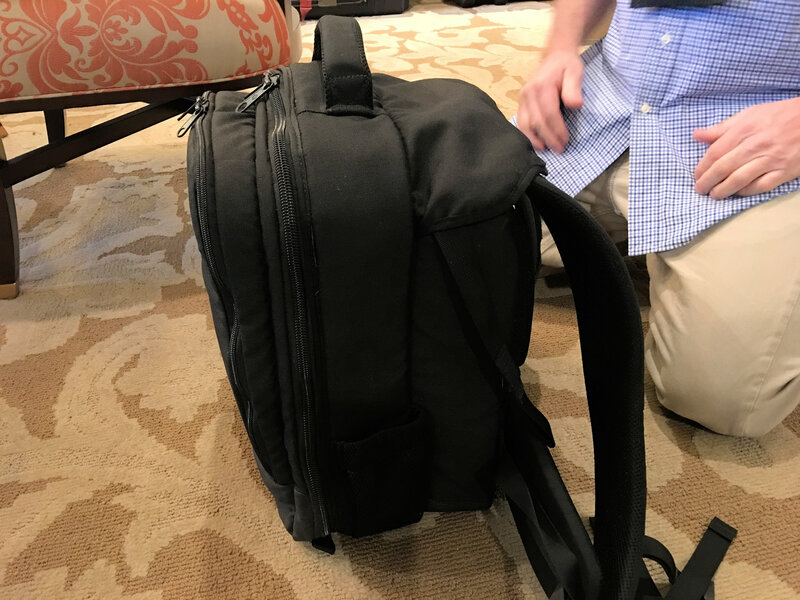 The back plate is built into a hidden sleeve in the backpack itself. You are now fully armored up in under 1.5 seconds, going from a guy wearing nothing more than a standard looking backpack, to a fully armored personal ready to stand up to a high caliber ballistic threat. The second biggest feature outside of the armor deployment, would be the capability to have a handgun fixed to this same front plate carrier that goes from total concealment to gun on target in less than 2.5 seconds. It breaks down to 1.5 seconds to deploy plate carrier and one second to have gun off chest on target. We developed a tear pouch that not only holds the gun secure during front plate deployment, but also has a tear open feature that allows you to get to the gun in half a second. 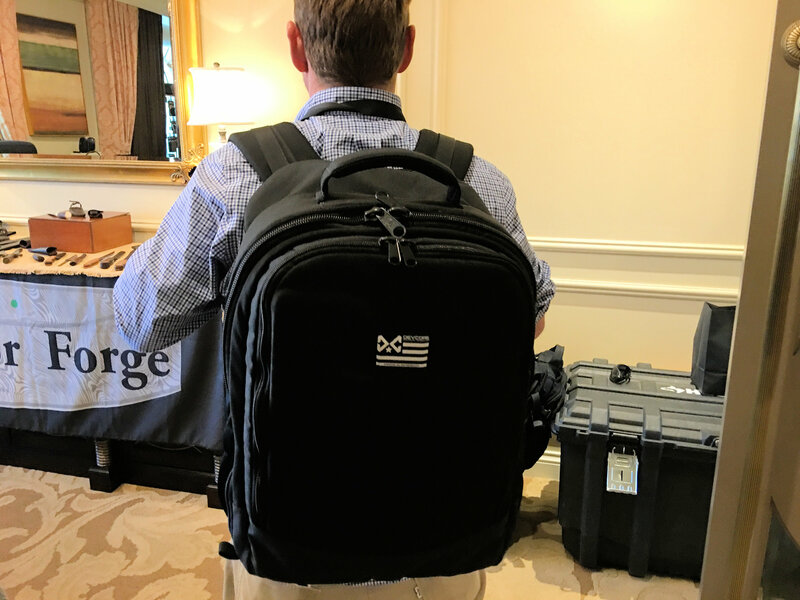 We guarantee that no other concealed armor system on the market can go from backpack to full plate protection with gun on target in under 2.5 seconds. One other note, your backpack itself never has to be opened during the deployment of the plate system. The (prototype) Devcore DOA Backpack plate carrier pack is really an amazing design. It’s honestly one of the coolest pieces of combat/tactical gear Defense Review has ever seen. so we can’t wait to see the production version(s) of it. 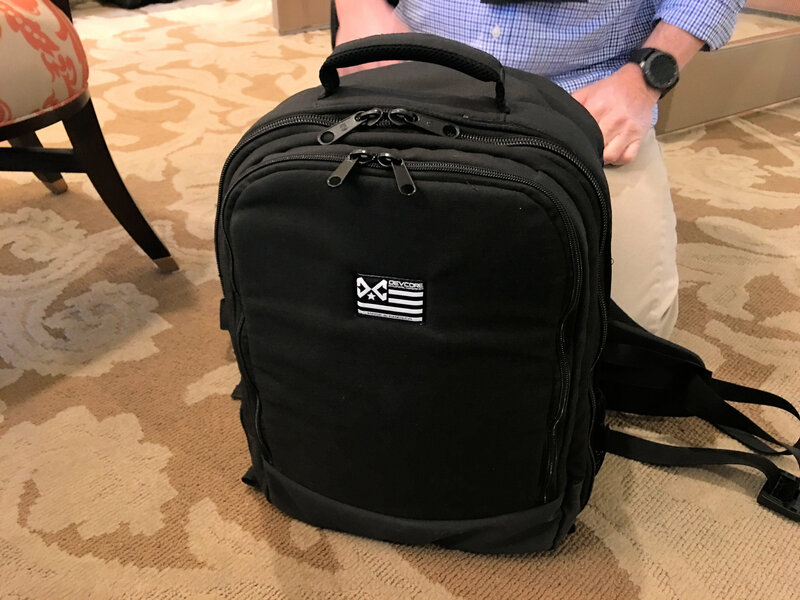 We should also note that the DOA pack is going to be made right here in America (USA), so it’ll be Berry Compliant, and of the highest quality of manufacture. Condor Elite Prototype FLASH Ultra-Lightweight Tactical Armor Plate Carrier, Mag (Magazine) Pouches and Tactical Accessory Pouches: Lightweight Combat/Tactical Design Taken to the Next Level!